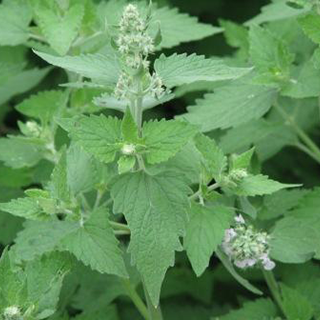 Also known as catmint, catnip, as the name implies, is much loved by cats, who will roll ecstatically in the young plants. Native to Europe and Mediterranean regions, but now naturalised in many parts of the world, the herb is used for digestive disorders or feverish chills. As a gentle remedy, it is also safe to use for many childhood disorders. The warm tea is often effective in bringing on a delayed menstrual period. It is also used as a sedative for treating sleepiness, for dispelling headaches and sweating out fever. Drink 1 cup (2 tsp dry herb per cup boiling water) 3 times a day for colds, flu, stomach upsets, and indigestion. Reduce the dose, depending on age, for children and use for childhood illnesses, colic, or emotional upsets. Take up to 1 tsp (5ml) 3 times daily with the infusion for headaches associated with digestive disturbances. Use 1–2 tsp (5–10ml) neat externally as a friction rub for rheumatism and arthritis. Use up to 1 quart (1 liter) of a well-strained standard infusion to clear toxic wastes from the colon. Apply 2–3 times daily for hemorrhoids. Prefers moist but well-drained soil in full sun. Sow the seeds in autumn in trays of compost in a cold fame and transplant to 3in (7.5cm) pots when large enough to handle. Plant in early summer in their final growing positions. Alternatively, propagate by root division in autumn or spring or take cuttings in spring or early summer. Self-seeds in favorable conditions, especially in gardens where there are no cats. Said to repel aphids, cucumber beetles, and other pests in companion planting. Cut the aerial parts just as the plant is starting to flower.